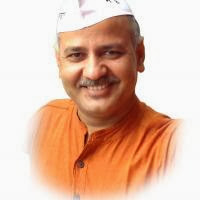 Aam Aadmi Party had declared Manish Sisodia as the MLA candidate for Delhi Assembly Elections 2013 from the Patparganj constituency. Below are the some of the details about Manish Sisodia. Manish Sisodia is a social activist who was actively involved in Janlokpal movement with Annaji. He is a journalist by profession and had worked in Zee news and All India Radio for a long time. After that he actively involved in the struggle to pass the RTI act and played a key role in laying the foundation of the Jan Lokpal movement. He also sat on a fast for 10 days in demand for forming a SIT to probe the mis-approprities of corrupt ministers. He was also sent to jail with Anna Hazare ji in the struggle against corruption.